It occurred to me the other day that I had never properly introduced our new little one.... Life has been crazy these past 4 months as we've adjusted to life with 3. Her birth was an easy one. I actually wasn't even sure that I was actually in labor until the contractions started coming less than 5 minutes apart. We ended up speeding to the hospital in the wee hours. She was born about 15 minutes after we got to the hospital. I'm very thankful that we didn't wait any longer to go, or she would've been born in the car. The most amazing part was that she was born in the caul. That's where the baby is born in the amniotic sac. So glad I didn't wait for my water to break, because it never did! 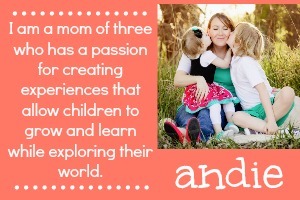 Since her birth, I've been trying to keep my head above water in all things domestic. There's always a load of laundry to wash or fold, dishes to put away, clutter to pick up, or floors to clean. I keep telling myself that I'll get back to blogging regularly, but it just hasn't worked out that way. I know that you understand completely when I say that there aren't enough hours in the day to get everything done that I want to. 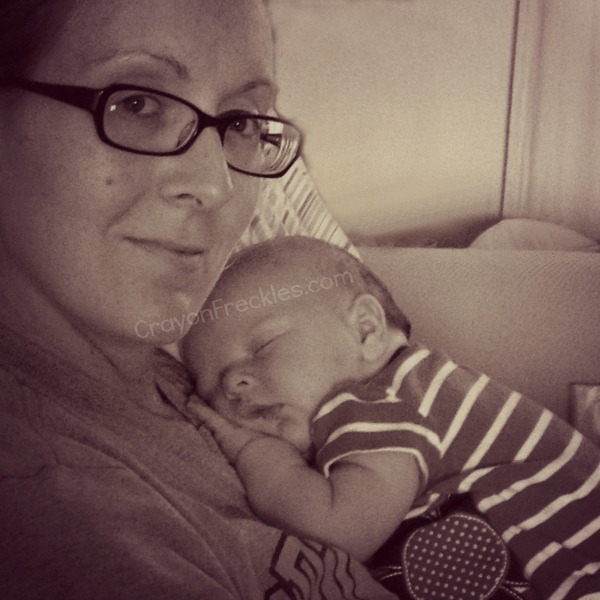 For right now, being a momma and loving on this little angel is my main focus, so I hope you all understand. 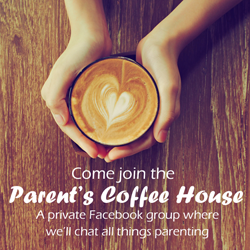 But there will be a new post every week, so make sure that you're still stopping by to check. Monsters have an appeal year round, but this time of year, monster activities are in high demand around these parts. Monster activities for kids can be presented in various ways... As art, sensory experiences, science experiments, math, and more! 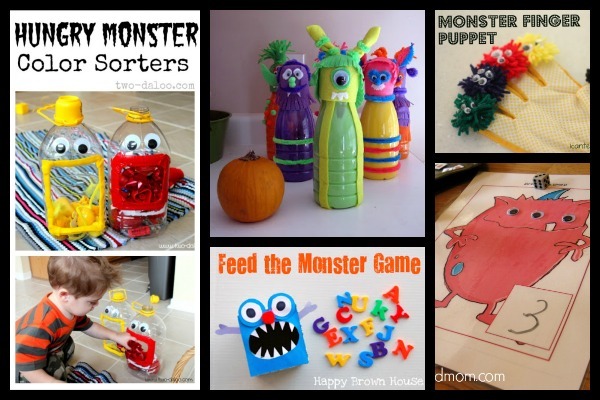 Here are some fun and educational monster activities for preschoolers from some of my favorite bloggers. Sort by colors with this easy to prep Hungry Monster color sort game from Two Da Loo. 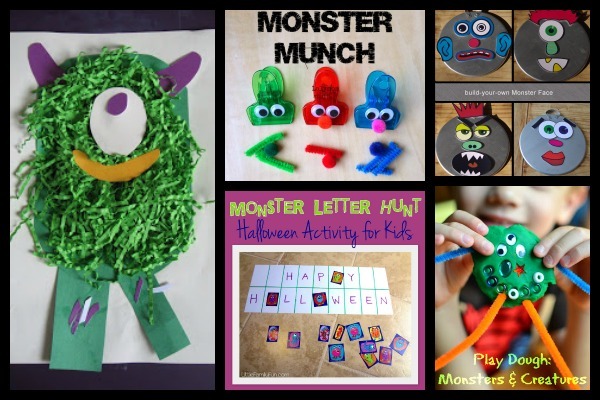 Practice letter sounds with this Feed the Monster Language Game from Totally Tots. Spook up math practice with monsters like The Measured Mom did. Practice color sorting with this monster eyeball sorting game like Prekinders did. 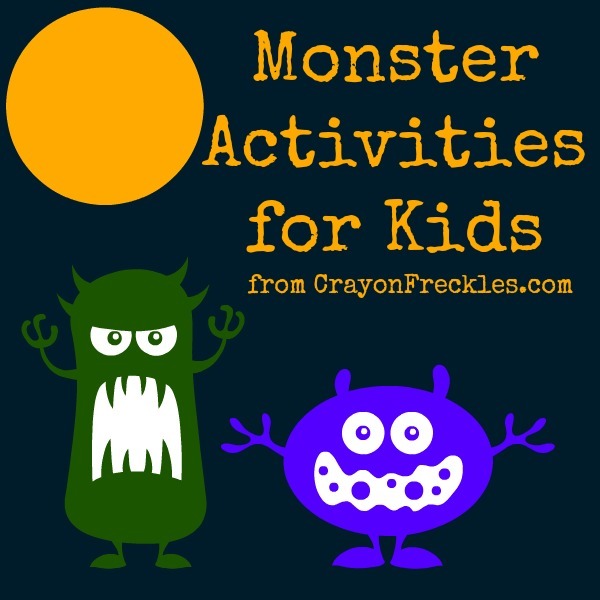 Put on your own puppet show with these free monster puppet printables from Picklebums. Break out the markers and water bottle and make these colorful monster prints like Housing a Forest. Grab a sandwich, then make these bread tag monsters inspired by Inner Child Fun. Get a little messy and do this fuzzy monster craft from No Time for Flashcards. Work on both small motor skills and colors with this monster munch game from LalyMom. 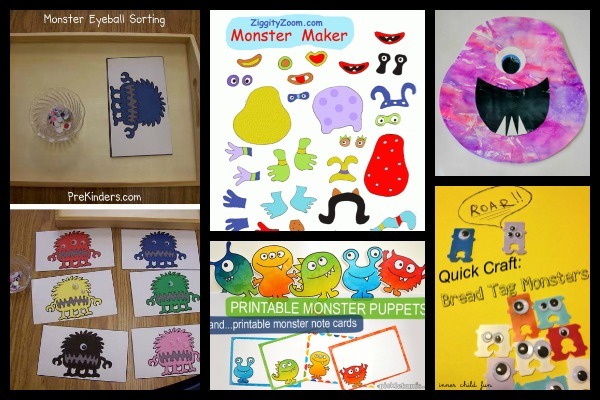 Use these free printables from The Creative Paige to make a build your own monster face game. 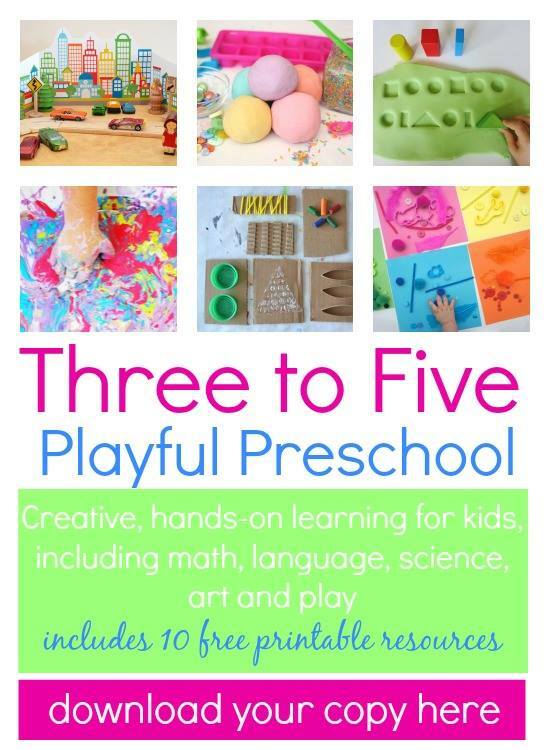 Break out the playdough and make playdough monsters. Practice ABCs by doing this feed the monster game from I Can Teach My Child. 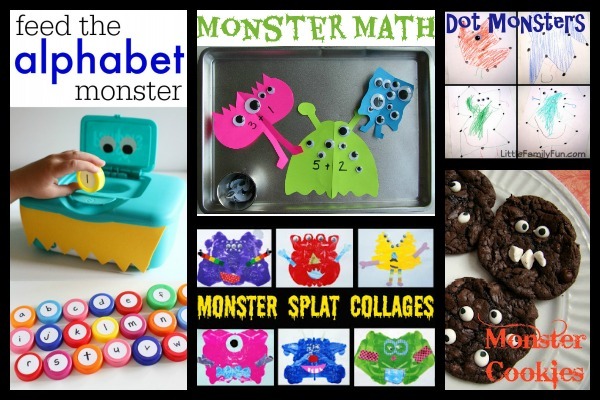 Work on math skills with this fun monster math tray from No Time for Flashcards. If you're a monster and you know it, check out this smash art project from Totally Tots. Roll up your sleeves and bake some monster cookies like Reading Confetti did. Get your hands dirty with this awesome monster slime from 123 Homeschool 4 Me. 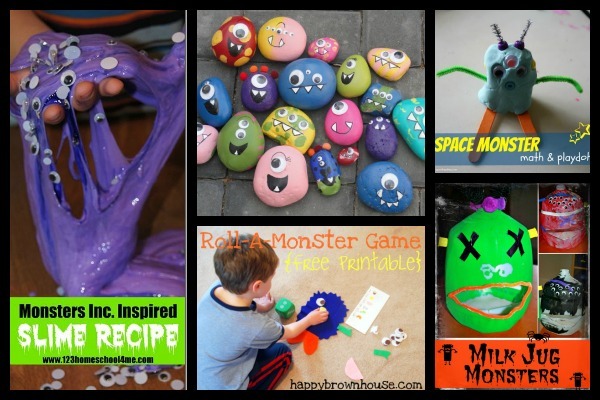 Dig up some rocks from the garden and craft these rock monsters inspired by Kayboo Creations. Use this free printable game from Happy Brown House to build your own monster. Craft a milk jug monster inspired by Learn ~ Play ~ Imagine.